Three drummers hit the headlines! The project "Schlagzeilen 2013" was launched on January 1st, presenting freshly produced movies of our latest compositions and related tutorial videos every month. Passionate drumming, noise and nonsense for all enthusiasts. By now, the project has finally reached its climax! And not just three drummers did make it to the finals, no, there were 110 of them!!! Everyone who felt like going on a little Playmobeat cruise with us sent their clips that we processed in an ultimate editing marathon into the big "Schlagzeilen 2013"-Finale. From Australia over Finland up to Brasil – the feedback was overwhelming, and the screening of the submissions alone was pure pleasure! 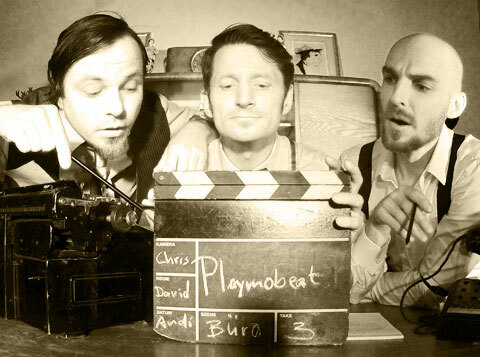 And here they are – the 12 ultimate Playmobeat videos of the year 2013 – Composed, arranged, put to music, filmed, cut, edited and published by PLAYMOBEAT!